Wole Soyinka and Democratic Forgiveness? 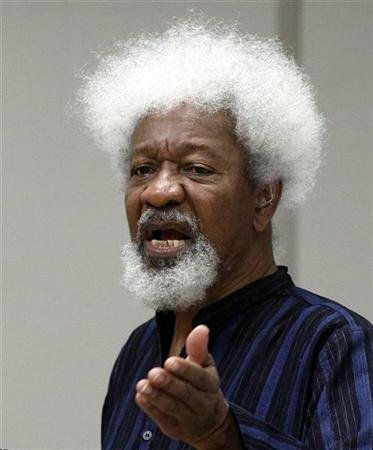 In a very revealing and dramatic recent Guardian interview conducted by correspondent David Smith http://www.theguardian.com/books/2015/mar/29/wole-soyinka-interview-nigeria-corruption-goodluck-jonathan, Nobel laureate Wole Soyinka lamented the process of the ongoing Nigerian general elections tainted by desperation, violence and corruption. He even tried to personify Mandela in his forgiveness of Buhari. And yes, it’s Official! Soyinka claims to have forgiven General Muhammadu Buhari (Rtd) who he for decades characterised as being the former “head” of a crapious, inhumane, punitive, abusive, oppressive and repressive military regime. A stark quote from the article was “Soyinka admitted: “My memory of General Buhari has become rather mixed up. Four years ago I certainly wasn’t even prepared to consider the possibility of a genuine ‘born-again’. But at the risk of being proved wrong, I think we have a case here of a genuine ‘born-again’ phenomenon.”” ‘Mix-ups in memories’ are excusable for an octogenarian. Rational thinking people knew Soyinka’s preferences all along. We should now expect a new type of forgiveness from Nigeria’s only Nobel laureate (others are on the way coming); the ‘forgiveness of elected democrats’ who were never in the military. Wole Soyinka is definitively unforgiving of President Goodluck Jonathan, a true democrat, for corruption, Boko Haram and Chibok Girls. He goes as far as characterising Jonathan as the “captured” ‘head’ of a very ‘sinister force’ and ‘sinister cabal’ in Nigerian politics invoking the “clueless” tag. Remember the Buhari characterisations? Soyinka is not oblivious to the phenomenon of “inverted totalitarianism” imposed by corporations and special interest groups on democracies around the globe. The capture elected by corporations and Godfathers has always been the bases of Nigerian politics, maybe Jonathan’s personality made it more obvious. Soyinka says in the interview “When you are informed that 200 children are missing, you don’t go to dinner until you have got to the bottom of it”. That is the classic Soyinka “moment”. There are many things Soyinka has seen and sees daily in Nigeria long before Jonathan came to power that would never happen in decent country. This is not to defend Jonathan’s fiascoes some very embarrassing, Soyinka is spot on with “moment juice”. Previously, Soyinka had said also in the same Guardian, “But whilst Boko Haram may have its origins within the ‘Almajiri’ foot soldiers of northern politicians, something then happened that they did not expect. The foot soldiers turned on their alleged political mentors, forming the wild and uncontrolled movement we see today.” O Jonathan! What have you done?! The corruption Soyinka talks about in Nigeria is a national norm. Most of the statesmen elite in Nigeria “chop” somehow even if only accepting prebendal rents and instances of such are neither too difficult to spot nor prove. It’s something Soyinka knows insightfully. Soyinka’s silence about corruption in certain areas and by certain politicians is uncharacteristic and disconcerting especially that which is alleged of the only two Lagos State governors since 1999. There are many explanations of such an observable attitude. However, selective or non-panoramic criticisms and prosecutions of corruption helps corruption persist, inadvertently or deliberately. Nevertheless, the articles Wole Soyinka and Military Forgiveness Parts I & II have been effectively vindicated (see http://wp.me/p1bOKH-bO and http://wp.me/p1bOKH-cl). Simple. Wole Soyinka is already in his 80s; I would love to see the day when the “moment” that will make him forgive Goodluck Jonathan and other democrats arrives.